Analytics has become a major component in today’s Sports Industry. It is very important to understand the role that Analysts play in Sports in the entire world. The Analysts provide with new level data and give data and plans for level data and give data and plans for athletes training, coaching, evaluate talent and fan engagement. India Sports Analytics Conference (SAC) 2017. The Sports Analytical World Series held a Conference for the first time in India named as ‘India Sports‘India Sports Analytics Conference (SAC)’. India SAC is a premier forum for industry professionals and executives interested in the role of data and analytics in the Indian and global sports industry. The attendees included professionals from across all fields like marketing, technology all fields like marketing, technology, sports, analytics and many more. There were around 400 plus attendees who were a part of this conference. 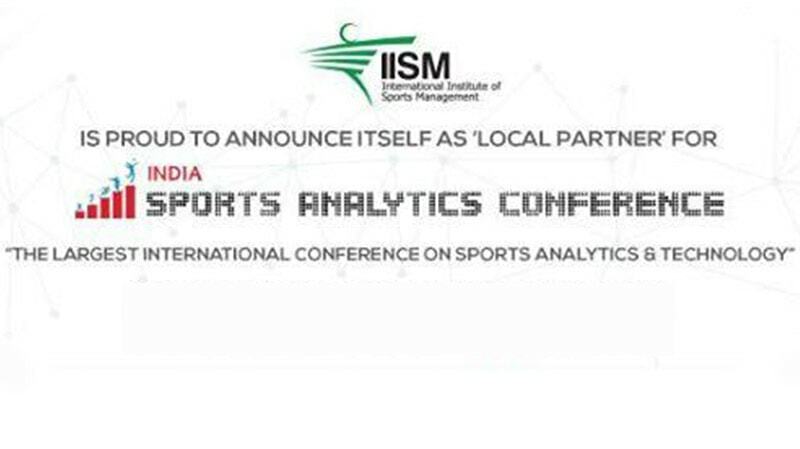 The International Institute of Sports Management (IISM) is proud to be the Local Partner of ‘The India Sports Analytics Conference 2017 Analytics Conference 2017’ which was held on 12th and 13th of October at the Novotel Mumbai, Juhu. This was a great opportunity and a wonderfullearning experience for students at IISM who attended the two day conference. Then there was an interesting session on “Electronic Gaming: Cricket Australia’s New Frontier” & how electronic gaming has penetrated into the market by Mr. Apurwa Surve, Strategy Manager,Cricket Australia. Another amazing session was discussed by Mr. Gaurav Sundararaman, Senior Stats Analyst, ESPN on “Influence of Analytics in on field decision making & Broadcasting”.This was followed by few sessions about the latest innovations in VR & Sports by Miheer Walavala-kar-Founder & Chief Business Officer, LiveLike and Mr. Paul Gustin, Deakin University who gave an outline of how effectively Data Analytics, Sports Technology & Athlete Monitoring.The day ended with a session – Game Changers which showcased Indian Startups and Innovation in Sports Industry. There were two tracks which ran simultaneously. The first day began with Track 1 which based on‘Sports Team & Leagues along with Brands & Sports Marketing’ and Track 2 was based on ‘Sports Technology & Data Science’. Then there was an interesting session on “Electronic Gaming: Cricket Australia’s New Frontier” & how electronic gaming has penetrated into the market by Mr. Apurwa Surve, Strategy Manager,Cricket Australia. Another amazing session was discussed by Mr. Gaurav Sundararaman, Senior Stats Analyst, ESPN on “Influence of Analytics in on field decision making & Broadcasting”. This was followed by few sessions about the latest innovations in VR & Sports by Miheer Walavala-kar-Founder & Chief Business Officer, LiveLike and Mr. Paul Gustin, Deakin University who gave an outline of how effectively Data Analytics, Sports Technology & Athlete Monitoring.The day ended with a session – Game Changers which showcased Indian Startups and Innovation in Sports Industry. The second day of the conference was as good as the first day. Various speakers spoke on topics such as how we use data and analytics to identify potential Olympic medalists for India, Off-field Analytics, Microsoft Sports General Manager Sebastián Lancestremère and Silvestre Jos, LaLiga CTO shared the keys of their project ‘LaLiga’. This was followed by two Panel discussions, one on ‘Indian Business Leadership-Sports Technology for the India Future’ and other ‘Sports Performance Analysis and High Performance in India’. Here various professionals gave their viewpoint about the Sports Industry and how important Analysis has become in Sports. One of the Speakers for the first panel was was our Founder-Director Mr. Nilesh Kulkarni who discussed about the importance of having trained upcoming professionals and youth in terms of managing the sports and its various aspects. The day as well as the conference ended up by a final session of networking with all the attendees, professionals and speakers. A great two days of knowledge and experience came to an end with so much to take away from. We thank Sports Analytics Conference India for such an incredible opportunity to help students understand the real world scenario and provide such an outstanding and enduring experience.